The promise of a paperless QC system is the chance to use computing and communications technologies to improve imaging operations. In particular, it can make it easier for networks of imaging sites to stay on top of QC needs. Of course, one of the big needs in QC is to have all of the information needed by inspectors available at the point of inspection – including QC documents. Any imaging facility needs to create, manage, and track a large number of documents related to the QC process -- from physicist acceptance and annual surveys, to safety and procedure documents, dosimetry reports, and service records, to records related to imaging unit de-commissioning. QC-Track offers a new way for imaging facilities to centrally store, manage, and quickly access the entire range of QC documents. 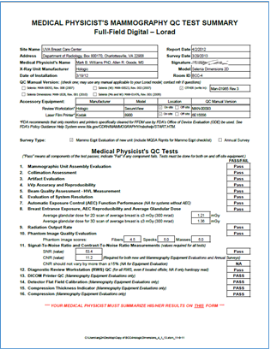 And since QC-Track is an intranet application, QC documents can be accessed from anywhere on your healthcare system’s network, making it easier than ever to have the documents needed by inspectors.